If anything good has come from all of the attention focused on the Michael Vick case over the course of the past several months, it’s that the issue of animal fighting is drawing more public and legislative attention. Not only are both banned in most states (dogfighting is illegal in all 50 states and the District of Columbia, cockfighting in 49,)Â there appears to be a trend now toward going after spectators at these blood sports. The thinking is that, if stiffer penalties are brought for paying money to attend fights, that people will stop going, and animal fighters’ financing will dry up. While it is not, in fact, that clear-cut an issue, the increased attention by legislators is a step in the right direction. A picture of a cat addicted to crack cocaine was leaked by friends of the frontman for the band The Babyshambles. Pete Doherty, who was dating Kate Moss, is said to be regularly getting his cats high on drugs. “They said it PASSES OUT with its paws in the air, suffers MOOD SWINGS and even thinks it can FLY,” according to the description in the UK’s The Sun tabloid. The leaked picture of the cat Dinger — named after a slang term for a syringe — is shown above. Earlier this month, the state of Virgina established the online Virginia Dangerous Dog Registry. This site allows residents to find dogs in their county that have attacked a person or an animal, and that a judge has decided could cause injury again. Two pictures of the dog (front view and side view), address of the owner, and the incident are public information on the registry. Officials in Virginia created this registry after dogs killed a toddler and an 82-year-old woman in separate incidents during the past two years. The registry was created for the state to deal with dogs deemed dangerous. 33 states and the District of Columbia hold owners legally liable if their dogs injure or kill. Amidst the growing legislations, lawmakers struggle to balance between the fine line of public safety without invading the privacy and property rights of dog owners. Many national dog owner and veterinarian associations say the specific breed bans are difficult to enforce and ineffective since, they say, if one breed is banned, dog owners seeking aggressive dogs will simply begin fostering fierceness in other breeds. Last month, Maryland animal control officers seized a woman’s pet capuchin monkey from her house under the suspicion that her monkey was illegal according to Maryland’s wild animal law. The owner said that Armani, her monkey, was born last May and would not be illegal because she had him before the law was put into effect. Authorities believed that the monkey was only five months old and that the woman bought him after the law was passed. Armani has been in temporary custody at the Catoctin Zoo. A decision has finally been made in the custody case. The Montgomery County Animal Matters Board has decided to not give her pet monkey back. They ruled that Armani was only five months old and that his owner could not have owned him before May 2006. Armani’s owner plans to appeal the decision arguing the Montgomery authorities improperly mixed state and county wild-animal laws. She has also sued the Montgomery County Police for seizing Armani. More about the custody case after the jump. The Animal Protection Amendment of 2007 is currently being reviewed by the DC City Council. It contains a wide range of animal-related legislation, among others. More information about the Animal Protection Amendment Act of 2007 after the jump. Clinton Portis is apologizing for his comments that he made on May 21 in regards to dogfighting. He says: “I didnâ€™t know it would affect that many people, didnâ€™t think what I said was that offensive. But after doing research and seeing how serious people take this, I shouldnâ€™t have made the comments.â€ He says that now he realizes that some people “are crazy over pets”. I guess that’s an apology. Sort of. The Washington Post posted a transcript of their online chat with Dr. Robert Poppenga, a board-certified veterinary toxicologist and professor of clinical veterinary and diagnostic toxicology at the University of California at Davis. The chat includes information on safety of melamine in dish-ware, scientific investigation into the toxicity of melamine, connection with liver failure and more. Tony Bennett sang about San Francisco and now The Humane Society of the United States is singing praises about this city. 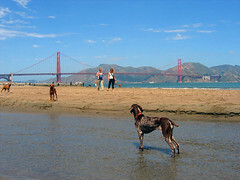 Thanks to San Francisco’s pet friendly hotels, off-leash dog parks, vegetarian restaurants, it is ranked as America’s most humane city. Seattle, Portland, Washington D.C, and San Diego followed in ranking after San Francisco. Some of the factors that were used in the ranking were: the number of fur retailers per capita, the number of puppy mills, and the ratio of wildlife watchers to hunters. A 99-cent unit of “cuts and gravy” is the signal product of global industrialized food, where nothing is wasted, a brutal efficiency rules and ingredients are assembled from a relentlessly competitive international marketplace. There is no accident in a can of dog food. Just the opposite. The contents have been supplemented and fortified for nutritional, mineral and vitamin balance, the foods precisely engineered for smell, texture and palatability. April is Animal Cruelty Prevention Month (apparently Menu Foods didn’t get that memo). 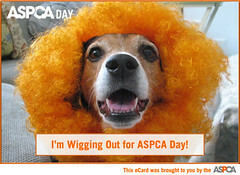 To highlight this great month, ASPCA (American Society for the Prevention of Cruelty to Animals) will be celebrating ASPCA Day on Tuesday, April 10 and are encouraging pet owners to “Go Orange For Animals”. Buildings and landmarks in several cities like New York, Chicago, LA, Austin, Washington, DC , Tampa and Philadelphia will be lit up orange in support of the day. If you live in New York, come to the ASPCA Day Festival in Union Square on April 10 from 4-8pm. There will be music, pet tips, food, photos with your pet and much more. How can you celebrate? Light up your house orange. Wear and hand out orange glow sticks (it will remind you of all those raves you went to). Tie orange bows on trees, doors or even on your dog. You and your dog can wear orange — get out all of that orange clothing that you thought was cool when you first bought it but haven’t worn it since. Don’t worry, people won’t make fun of you because it’s for a good cause.